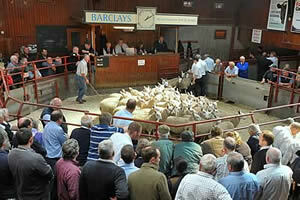 The Cumberland & Dumfriesshire Farmers Mart had forward 2,516 store lambs at their sale at Longtown on Tuesday 21st December, 2010. Another good show saw all classes an exceptional trade. Top of £70 for Texels from Ormiston, others £69.50 Rockcliffe Cross; Suffolk £69.50 Borthwick Mains and Derwent House, £69 Cottage Farm; Greyface £69.20 Plenderleith, £67.50 Haithwaite, £67.20 Clerkleap; North Country Cheviot £68.80, £65.50 Philiphaugh, £62.80 Clerkleap; Cheviot Mule £65 Easter Alemoor; Blackface £64 Easter Alemoor; Hill Cheviot £61.50, £59 Falnash, £56 Hartsgarth; Swaledale £49.50 Devonport Farm, £48.50 Westburnhope. Ewe lambs to £66 for Greyface from d’Mainholm; Blackface £63.50 Plenderleith; Cheviot Mule £62 Easter Alemoor.